Since the recession of 2008, the American economy has clearly been on the upturn and slowly but surely improving. However our friendly, hockey loving neighbors to the north in Canada are experiencing the slowest economic downturn since 2002. The Canadian Dollar, also known as the Loonie, was valued at .68 cents American at the beginning of 2016 and has since climbed back up to .79 cents American. Undoubtedly this has a huge impact on Canadian consumers, as their money is worth less and less with financial experts saying that they anticipate it to only keep dropping over the coming months. It is widely known how much consumers love spending their money on sports: tickets, cable packages, merchandise, etc. 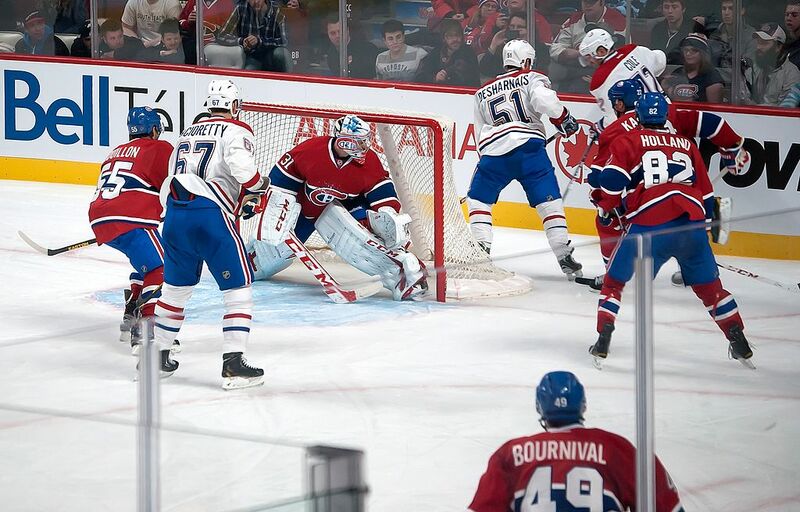 The National Hockey League (NHL) in Canada is comparable to the National Football League (NFL) in America in regards to popularity, media buzz and revenue generation. Although there are 30 (soon to be 31) NHL franchises, and only seven of them are located in Canada, the Canadian marketplace has accounted for 30-35 percent of NHL revenues (which hit $3.98 billion for the 2014-15 season). Since the Canadian marketplace accounts for about one-third of all the league’s revenue, this means that a 10-15 percent decrease in the value of the Canadian dollar can drastically bring down league revenues. Furthermore the NHL is a league with a hard salary cap, meaning the cap is firm each season and readjusted each season depending on league revenues, this economic issue with the Canadian dollar even reaches US NHL franchises. Although this issue is not directly the result of any failure by the NHL, it is still a market factor that they need to address and tackle, finding a way to still come out on top and compete with the NFL, MLB, and NBA. Taking a more in-depth look at the NHL, one might conduct a PEST-C analysis. Hockey Canada and USA Hockey are the two big governing bodies that control the real legal aspects of the sport. Within these organizations are layouts and protocols for all the legal aspects that go into running a team at all levels of the game. These governing bodies also take into account player safety, education programs, and providing players and professionals alike; providing them with all the resources they need to be successful within the game. The economic impact is the most obvious one, with the Canadian Dollar’s weakness being at the forefront of economic factors facing the NHL. With these bad economic circumstances, consumers might not be willing to spend the kind of money they maybe once did on NHL products whether that be actual game tickets or merchandise. The target consumer for the NHL is pretty narrow and broad at the same time, a blue collar working man aged 18-60 and a good majority of them have families who are hockey fans. Naturally, the cost of living is already enough to try and maneuver through during an economic downturn, spending extra money on sports may not be very high on the priority list anymore. The social aspect varies depending on the country and the marketplace and the attitudes of those consumers. Canadians are die-hard hockey fans, which would explain how historically that they’ve accounted for so much of the league’s revenue. In America, it really does vary greatly on the marketplace, however it is fair to say hockey has been growing more and more in popularity in America over the last 5-10 years. Your “original six” markets such as Detroit, New York, Boston, and Chicago will always do well; whereas un-traditional hockey markets such as Phoenix and San Jose it really hinders on team success to generate lots of revenue. Lastly for the technological aspect, which could be a real breakthrough for the NHL in the coming decades. New arena technology keeps being surfaced with each erection of a new NHL arena (new arena in Edmonton for 2016-17, new arena in Detroit for 2017-18). This new technology, some of which is interactive with the experience of attending an NHL game, allows the consumer to perceive a greater value for essentially the same price they were paying to watch games at the team’s old arena. The NHL has even been in talks with the company GoPro in using their cameras on player and referee helmets during the game to give fans an even closer look and feel as to what it’s like to be on the ice during an NHL game. It is safe to say that without the Canadian market the NHL would not have lasted nearly 100 years and be the multi-billion dollar a year industry it is today. The NHL put in place a three year marketing plan with three main goals in 2013: generate an additional billion dollars in revenue, a sharper international focus with more events, and a major TV deal. The NHL has succeeded in two of those areas already: the international appeal and the TV deal. With the rebirth of the World Cup of Hockey (WCOH) slated for the fall of 2016, the eight team tournament will be entirely run and marketed by the NHL and they will also collect all that revenue from the WCOH. With the television deal, the NHL and NBC had already agreed to a groundbreaking 10-year American broadcasting deal in 2011, however their Canadian television deal with Sportsnet ended in 2012. The NHL and Rogers agreed to a 12-year television deal for Canadians viewers following the conclusion of the Sportsnet deal. The NHL is making approximately $2 billion (USD) from the NBC deal and a record breaking $5.23 billion (Canadian Dollar) from the Rogers deal in Canada. However, the biggest goal of another billion dollars in revenue needs more than just a lucrative television deal. 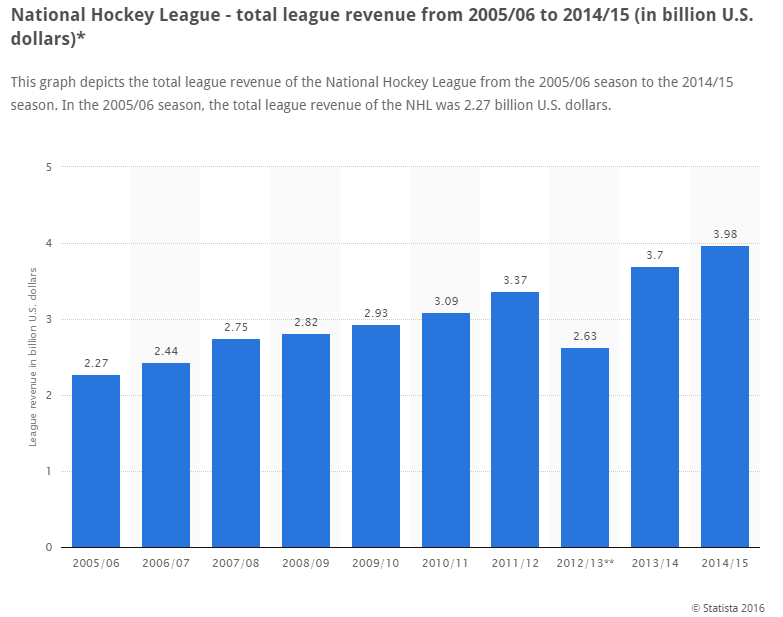 Since the 2004 league-wide lockout that cancelled the entire season, annual revenue has been on the rise each and every season (with the exception of the 2012-13 season, which was shortened via lockout but not cancelled entirely). As you can see, the NHL has been steadily on the rise for about 10 years now, which any company in today’s marketplace would consider a huge success. The numbers for the 2015-16 season will not be tallied up until the conclusion of the Stanley Cup Playoffs, but with the decline of the Loonie, will that number rise or fall? Will the NHL reach that lofty goal of an extra billion dollars when the numbers are finally tallied? Are these Canadian companies going to be willing to shell out extra money for these sponsorships you see all around the NHL arenas? Are the luxury suite sales and gate revenue generated in Canadian arenas going to keep growing? Or are the 10’s of millions of Canadian fans even going to keep spending money on their teams during this tough economic time considering the type of worker they are and the kind of income they generate? These are the kinds of questions the NHL and their marketing executives need to find a way to answer and keep their company moving forward and growing on a year in and year out basis. With all of this lined out, it would be certainly hard to argue that the NHL is doing anything worthy of being deemed a “failing” business although they may not be as successful as they would like to be. Compared to the NFL, MLB, and the NBA, the NHL still ranks in fourth place and trails the first place NFL by over $3 billion in total revenue generated. You have seen the efforts made by the league to keep revenue rising well into the salary cap era before we have arrived at this moment of uncertainty with how the Canadian dollar is going to affect the NHL for this year and seasons moving forward. The NHL’s biggest challenge as of right now is marketing and navigating a way through this recession in Canada. In an article entitled “Marketing your way through a recession” written by John A. Quelch, a professor of Business Administration at Harvard Business School, Quelch outlines key strategies companies should use during situations like the NHL is facing with their biggest market. He makes several great cases in the article, however there were three big ones that absolutely stood out to me. The biggest point he makes is about how these companies marketing their way through a recession should actually increase their spending on advertising, arguing that it can improve your market share and return on investment. He also educates marketing executives on keeping up with market research while focusing on family and emphasizing core values. Lastly, he brings up adjusting your pricing tactics and product portfolios to give your consumers a better perceived value during the economic downturn. I am here to argue that the NHL is doing a fantastic job taking the advice from the Harvard professor and his well-established marketing knowledge, and is doing a tremendous job maintaining growth during a time of economic misfortune in their biggest marketplace. In pertinence to advertising spending should increase while navigating a recession, the NHL has done exactly that. Naturally with a big television contract the likes of the one the NHL and Rogers signed in 2013, the ad space allotted to the NHL will go up significantly, as it has more NHL programming and events to advertise. Not only advertisement space for just the programming themselves but advertisements for other NHL products such as merchandise and team apparel. This also brings in advertisements where the NHL is a sponsor of companies like Geico Insurance and Discover, their advertisements play more often and every time they do an NHL logo appears on the screen as well. The NHL sees a value in continuing to advertise very regularly among the weak Canadian market and their doing it by focusing on the family and promoting their core values just as Quelch instructed those marketing executives to do. The core values of the NHL and the game of ice hockey are dedication, perseverance, and teamwork. If you take a look at any of the promotional advertisements the NHL puts out for the Stanley Cup playoffs and all their advertisements throughout the Stanley Cup Playoffs, these focus so heavily on the core values of the league while pulling at the heartstrings of their viewers and consumers. Another aspect was focusing on the family, and one advertisement that comes to mind was one from Enterprise Rent-A-Car where the entire advertisement focused on getting hockey fans and families to and from the rink. Flashy scenes of happy families driving from home to the game and cheering as their team scored the game winning goal. There are several other advertisements through the NHL and their sponsors with similar such content. Hockey has always had a very passionate fan base and a camaraderie type feel where your team is basically a second family. Who better to extend a better perceived value to than millions of people in your second family? The NHL has done a terrific job adjusting their pricing tactics and product portfolios to keep these fans still spending their money on the league in one way or another. The television deal with Rogers offers Canadian hockey consumers a better value for the amount they are paying for television services by getting more hockey games to watch. All 30 teams offer ticket discounts, promotional nights at the arenas, and even special pricing for product within the arena themselves to give their consumers a more well-rounded experience for a better value. The NHL’s website even offers more deals than ever before, and with the rising popularity of “shirseys.” Shirseys are player jerseys in t-shirt form, obviously a lot cheaper than your favorite player’s jersey. While the average NHL jersey will cost around $150, the average shirsey will cost about $30. These customizable shirseys have become one of the most popular items on the NHL website. Alongside the shirseys, the NHL offers a myriad of lower price options to express one’s fan hood that consumers perceive a better value than the expensive alternatives. More often than not the actual jerseys are not the top sellers anymore within the inventory, rather the less expensive options. I believe that it is incredibly safe to say that the NHL has a solid team of marketing executives leading the way through the Canadian recession. The efforts led can in no way be deemed a failure as of right now, however that could very well change once the numbers from the 2015-16 season are released. I would say with the utmost confidence the NHL has been doing very well, considering what they have been facing in their biggest market and a lot of credit go to the marketing executives at the league wide and individual franchise levels. When it is all said and done, and this economic downfall in Canada is back on the rise again, it will become clearer to see whether or not the NHL has succeeded or failed in this period. Undeniably, losing out on an eighth franchise in your biggest market is a big blow to take for the league, but the nice thing about expansion is there is the “always next season” mentality. Should the Canadian dollar take an upturn and back to fairly even with the US Dollar once again, expansion can and most likely will be revisited. Despite the unforeseen economic situation and factors that have begun to affect the NHL, it is easy to see that the league has done a good job “weathering the storm” up to this point. Keeping the Canadian market at that one-third of revenue mark is absolutely key if the NHL wants to keep growing and competing with the other major three leagues. Recessions do not last forever, and even since its lowest point in January the Loonie has bounced back some, but certainly not all the way back. The bottom line is the NHL has done a superb job positioning itself within this recession plagued market, and is still going to do well during this season in those Canadian markets. Once this recession is over, it is virtually a guarantee we will see those Canadian numbers dramatically rise and the NHL to truly compete with the NFL, MLB, and NBA for years to come. Matthew Meyer is a native of Sarnia, Ontario, Canada and a first-year graduate student at Central Michigan University in the Sport Administration program. He graduated from Central Michigan previously with his Bachelor of Applied Arts, with a major in sport management and minor in athletic coaching. Meyer also works for the Saginaw Spirit of the Ontario Hockey League as an assistant to the General Manager and Coaching Staff. Meyer spent three seasons as the head coach of the CMU Women’s Hockey team from September 2013 until he resigned in February 2016 to begin his current work in Saginaw and in his graduate program. Meyer has a passion for hockey and athletics that is second to none. Great content!! 🙌🏾 All in all, VERY COOL!! !